Disney 25% Off Your Entire Order! In Store Or Online! You are here: Home / Great Deals / Disney 25% Off Your Entire Order! In Store Or Online! 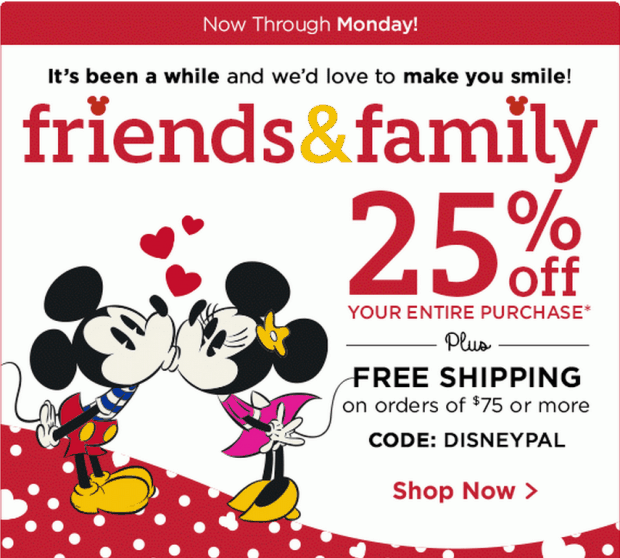 Disney 25% Off Your Entire Order! You can get 25% off your entire purchase at Disney in-store or online! To get your 25% off online, just use code: DISNEYPAL at checkout. To get your 25% off in-store, just print the coupon and take it with you! You can also get FREE shipping on orders over $75. Type the Promotion Code DISNEYPAL into the promo code area. In-Store & Online – Friends & Family Promotion: * Offer begins on February 12, 2015 and expires 11:59 pm PST, February 16, 2015, or while supplies last. Offer valid only on a single sales transaction at Disney Store and Disney Baby Store retail locations in North America, on a Disney Store phone order, or online at DisneyStore.com Not valid on purchases made at Disney Parks and Resorts retail or store locations. Limit one coupon or promotion code per Guest. Qualifying purchase based on pre-tax, post-discount amount and excludes shipping and handling charges, gift cards, gift wrap and gift boxes, publications, memberships, media, games and accessories, electronics, Disney INFINITY, Disney Theme Park passes, Limited Edition and Limited Availability merchandise, Dooney & Bourke, Vera Bradley, PANDORA Jewelry, Disney Parks MagicBand, Duffy the Disney Bear Collection, The Walt Disney Company Collectible Shareholder Certificate, and personalization charges. Offer cannot be combined with other offers (except with online purchases, offer can be combined with free shipping). Products subject to availability. No adjustments to prior purchases. Prices subject to change without notice. Merchandise must be in-stock at time of purchase and can only be exchanged for identical item or returned at discounted price with valid sales receipt (or packing slip for online purchases). Returns and exchanges subject to discount taken at time of redemption. Cannot be combined with Cast Member discount. Not valid at Employee Centers. Coupon or promotion code may not be redeemed for cash. Coupon or promotion code may not be sold, altered, or duplicated and will not be replaced if lost, stolen or corrupted. In-store coupon must be relinquished at time of purchase. Use of coupon or promotion code is acceptance of its terms. Offer may be canceled or modified at any time. Void where prohibited. Free Shipping applies to Standard Delivery only on phone orders and orders placed online at DisneyStore.com over $75 sent to a single shipment address in the U.S. Certain products excluded, as noted on specific Product Pages. If any single order is sent to more than one address, Shipping & Handling charges will be applied to each shipment address. Disney E-Commerce reserves the right to cancel or modify this offer at any time.